Michael Jordan fragrance and perfume list. Michael Jordan fragrances: by Five Star Fragrances. 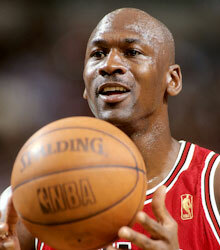 Michael Jordan is a former American NBA basketball player. Michael Jordan (born 17 February 1963 in Brooklyn, New York) is a former American professional NBA basketball player, and majority owner of the Charlotte Bobcats. "Air Jordan" won his first NBA championship with the Chicago Bulls in 1991. The Bulls and Jordan won the title again in 1992, 1993, 1996, 1997, and 1998. His Nike Air Jordan shoe endorsements were introduced in 1985 and remain popular today. Michael Jordan won 2 Olympic Gold Medals in 1984 and 1992, is a 6 time NBA Champion, 6 time NBA Finals MVP, and 5 time NBA MVP.